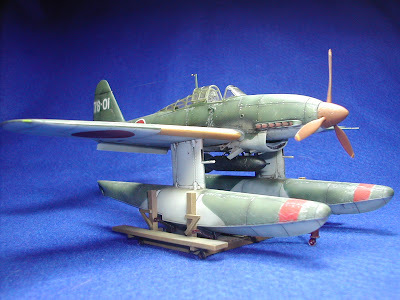 The Seiran Seaplane, with its clean lines and standard paint finish, calls for some special input to get a really eye-catching look. 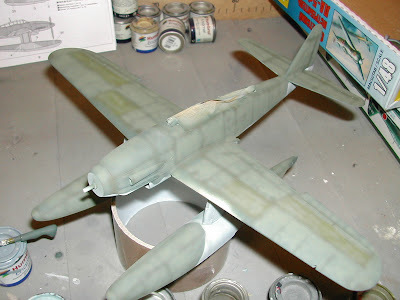 To start with, I sprayed the entire model in the underside grey. 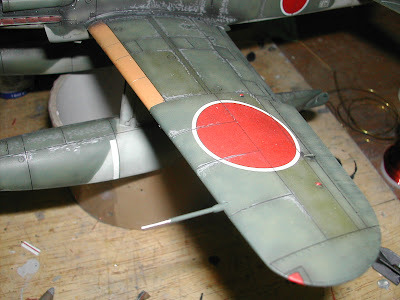 I then sprayed the upper side dark green before I added some assorted shades of green and tan. This gave me the requisite patchy, sun-bleached finish - something rather more realistic than a flat colour offers. On the photo you can see the difference between the panels - two are different shades altogether. 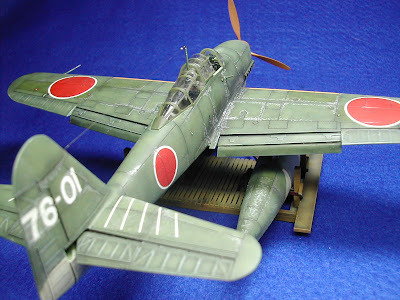 I then fitted the decals. 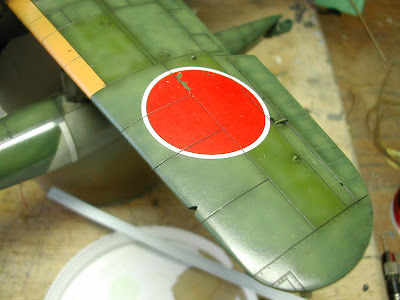 All the kit decals were crazed and broken up, so I had to find alternatives - there's another hour or two gone. The orange-yellow de-icing boots are painted on. In this photo you can see the completed wing. I chipped and faded the paint for a authentic field look. The matt varnish, when it dries, brings all the odd shades together and the picture began to make sense. 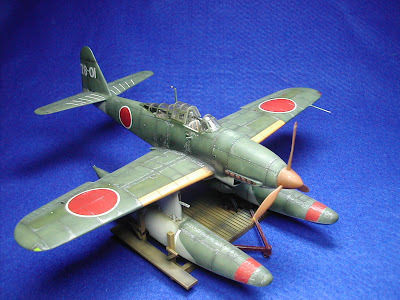 Many Japanese wartime aircraft are shown in appalling states in photos, especially the fighters. They show heavy exhaust staining and large sections of flaked paint, demonstrating weeks of heavy fighting. Many aircraft would be lost before they had a chance to get battle-worn, but a reconnaissance seaplane, flying from some remote Pacific island, would survive intact having endured some very rough treatment. This was the look I was going for. I've been through similar feats of endurance this week and here's what's come out of it. I'm very pleased. What do you think? Coming from you, a compliment indeed. Thanks for looking. Best yet to come!